The first day of main draw play at the BB&T Atlanta Open had to feel like old times for two veteran players making return trips to the tournament. Gilles Muller, back in Atlanta for the first time since 2012 when he was a finalist, cruised past Atlanta’s Donald Young, 6-2, 6-1 on the AJC Grandstand Court. Muller broke Young five times and never faced a break point. Muller also won about 70 percent of his first serve points. “I’m happy to be back, happy to be winning matches at that level,” said Muller, the seventh seed. Muller, who’s in his 15th year on the ATP World Tour, has played well in Atlanta during past years. In 2010, the tournament’s inaugural year, Muller played through qualifying and made the second round before losing to former Georgia Bulldog John Isner, who made the finals that year. The following year, Muller lost to Isner again, this time in the semifinals. During the 2012 final, Muller lost to Andy Roddick, who is playing doubles this year but not singles. That year also was the first time the tournament was held at Atlantic Station, a setup Muller prefers. 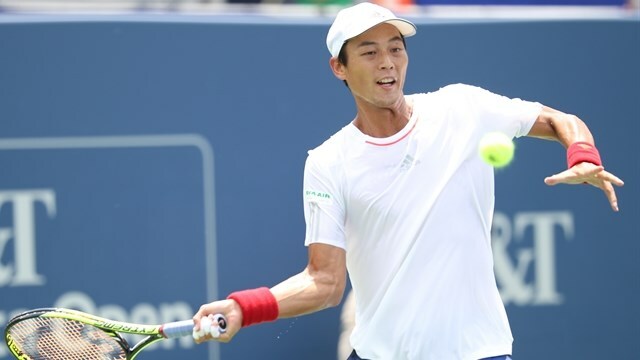 On Stadium Court early Monday evening, Go Soeda of Japan came back to knock off Ukraine’s Alexandr Dolgopolov, who was making his first appearance at the BB&T Atlanta Open. Soeda lost the first set, 5-7, losing his serve at 5-6. But when he served to stay in the match at 5-6 in the second set, Soeda held and forced a tiebreak, which he won, 7-5. In the third set, he outlasted Dolgopolov, 6-3. Soeda’s strong serving helped, especially in the third set, he said. For the match, he won 77 percent of his first-serve points. But during the third set, that percentage ticked up to 92. Soeda also hit seven aces against Dolgopolov. The match turned into a serving contest at times, with both players frequently serving aces or showing off one-two punch points. Dolgopolov laid 16 aces. The players’ fitness also affected the match, which lasted two hours and 13 minutes. Dolgopolov, who touched lines with his winners in the first and second sets, was less accurate in the third, Soeda said. “I think he got tired,” he said. A two-hour rain delay five games into the match gave both players some extra downtime. The afternoon showers didn’t bother Soeda, though. “It’s no problem for me. I can rest,” he said. Soeda, who turned pro in 2003, last played at the BB&T Atlanta Open three years ago, when he fell to Muller in straight sets in the semifinals. The two could meet again this year in the quarterfinals. Yen-Hsun Lu of Taipei also advanced in the main draw on Monday. Lu, who reached the second round of the BB&T Atlanta Open last year, beat Malek Jaziri of Tunisia, 6-1, 7-6 (14-12).